Foremost Wine Co. Named Among Top 100 Wine Restaurants in U.S.
San Luis Obispo, CA – Wine Enthusiast magazine (winemag.com) announced Foremost Wine Co. of San Luis Obispo (foremostwineco.com) among the top 100 wine restaurants in America for 2015. The annual “100 Best Wine Restaurants” issue hit stands July 7. “Our wine list includes everything from international to hyper-local bottles, but the common thread is that they’re all hand-made, a little geeky, and close to their roots, just like Chef Julie Simon’s cuisine,” said Owner, Rob Murray. Murray and the Foremost team worked together to curate the globe-trotting wine list, which includes Murray’s wine brands Tooth & Nail, Amor Fati, Stasis and Force of Nature. Foremost Wine Co.’s commitment to hand-made wine and cuisine is possible via the support of local farms from which they source their produce, as well as Rabble Wine Co., which encompasses Murray’s four brands showcasing vineyards across Paso Robles and Santa Barbara County. For more on Wine Enthusiast’s 100 Best Wine Restaurants of 2015, please visit winemag.com. 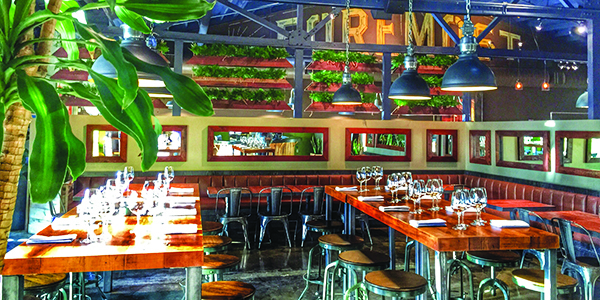 Supported by local farms and 1,000 acres of vineyards across Paso Robles and Santa Barbara County, Foremost Wine Co. is a restaurant and lounge that redefines farm-to-fork dining. At its helm is epicurean savant, Chef Julie Simon, whose uncanny ability to assemble vibrant, playful dishes has brought her to the forefront of the restaurant scene on both a regional and national scale. With produce sourced from local purveyors, Simon’s menu pairs seamlessly with an ambitious international wine list that placed Foremost on Wine Enthusiast magazine’s 100 Best Wine Restaurants list of 2015. For more information, please visit foremostwineco.com. Foremost Wine Co. is located in The Creamery at 570 Higuera Street in San Luis Obispo, CA 93401. For reservations, please call 805.439.3410 or email cheers@foremostwineco.com.